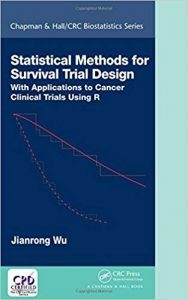 Statistical Methods for Survival Trial Design: With Applications to Cancer Clinical Trials Using R provides a thorough presentation of the principles of designing and monitoring cancer clinical trials in which time-to-event is the primary endpoint. Traditional cancer trial designs with time-to-event endpoints are often limited to the exponential model or proportional hazards model. In practice, however, those model assumptions may not be satisfied for long-term survival trials. This book is the first to cover comprehensively the many newly developed methodologies for survival trial design, including trial design under the Weibull survival models; extensions of the sample size calculations under the proportional hazard models; and trial design under mixture cure models, complex survival models, Cox regression models, and competing-risk models. A general sequential procedure based on the sequential conditional probability ratio test is also implemented for survival trial monitoring. All methodologies are presented with sufficient detail for interested researchers or graduate students.